The BHG Promo Celebrate Summer Time sweepstakes is open to legal residents of the United States who are 18 years of age or older. The official sponsor of the sweepstakes is listed as the Meredith Corporation who are based at 1716 Locust St., Des Moines, Iowa. Those who do not enter this promotion will be kicking themselves when they don’t receive a $500 gift card! 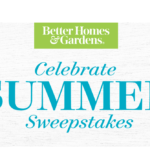 Contestants who have the strong desire to check out a list of winners associated with this Better Home and Gardens summer time promo can write to: Winner’s Name, BHG Magazine, ATTN: Celebrate Summer Sweepstakes, 225 Liberty Street, 9th Floor, New York, NY 10281. PLEASE make the winners list request after 7/26/18.